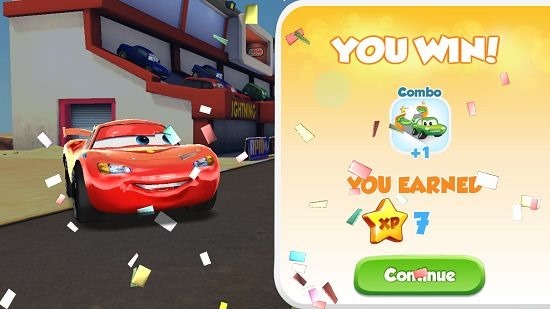 Cars: Fast As Lightning is the official free game app of Disney’s movie Cars for Windows 8 and 8.1. 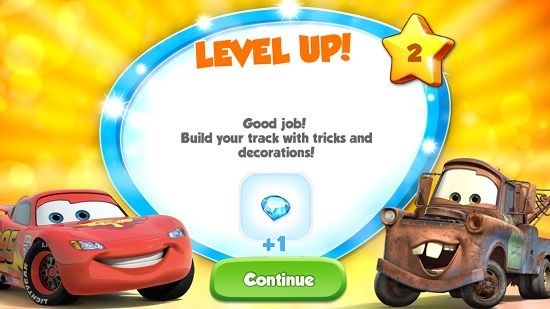 The game revolves around various cars who aspire to be as fast as the celebrated car Lightning McQueen who is the fastest and the best racing car. The game incorporates various levels of fun packed racing which allows you to race against various cars as a different car. The game has a side angle camera view in gameplay instead of the traditional rear angle view, and this makes the game challenging as well as more difficult at the same time. The game also has various shops where you can purchase stuff to make your track more challenging, buy tune ups for your vehicles, etc. 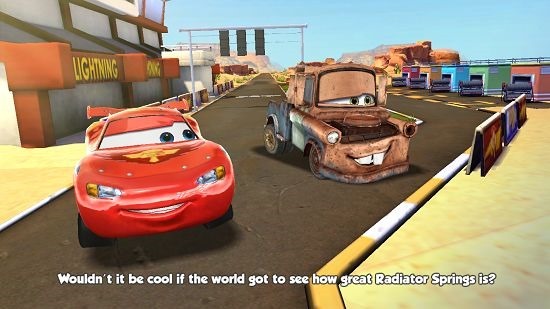 Cars: Fast As Lightning is available for free from the Windows App Store. 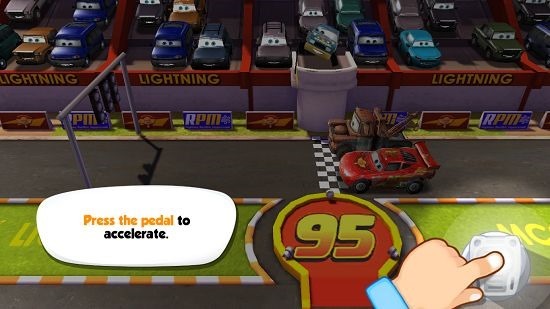 Cars: Fast As Lightning game when fired up on your device will show you the game’s main screen accompanied with a short introduction video. Once the game video has been played through, you will be taken to the main menu where you can start playing the game. A brief tutorial about the gameplay of the game will be shown, followed by the actual gameplay itself. The game has a simple control of tapping on the gas pedal at the bottom right in different patterns. This is the only control of the game, and the cars turn automatically. All you have to do is to assess when to press and when to release the pedal. Once the tutorial is over, you can start playing against the other cars. Your results of the game will be shown when the race is over, and these can be seen in the screenshot below. 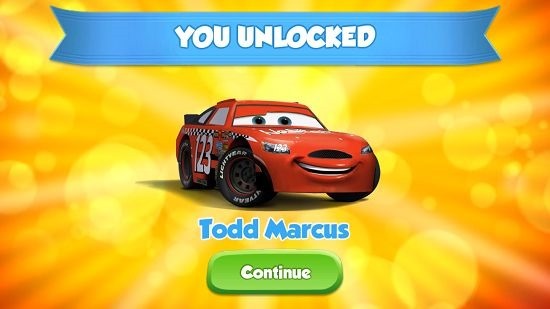 Throughout the game, you will be able to unlock new cars when you accomplish events like winning races, etc. You also level up in the game upon accomplishing certain events. These are basically all the main features of the Cars: Fast As Lightning game. You can also check out the iOS version of the same game which we reviewed earlier. You can also check out similar apps like Asphalt Overdrive and Asphalt 8: Airborne apps for Windows 8 and 8.1. Cars: Fast As Lightning is a great free game app for Windows 8 and 8.1 which has amazing graphics and smooth gameplay performance all around. The app has a pretty nice touch to it, and makes for a great car race game for all devices running Windows 8 and 8.1. My rating? A solid 5 out of 5! Get Cars: Fast As Lightning.